The TFV8 has seen an upgrade! 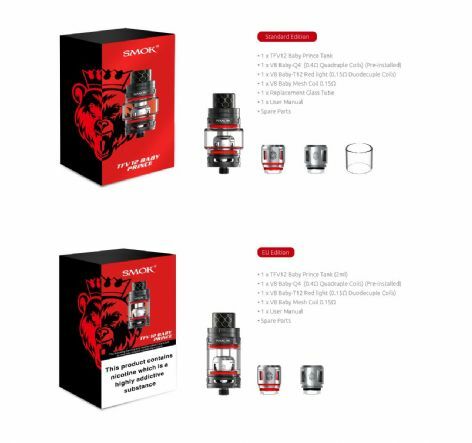 Introducing the Smok TFV12 Baby Prince, featuring an improved top fill switch cap. With a simple press of the button, this patented locking mechanism can effectively prevent you from accidentally opening the top cap causing e-liquid leakage. The prince also comes with a new variation of coils as well as being able to still use TFV8 V8 0.4Ω quadruple coils; they can also use the V8 Baby T12 'Red Light' 0.15Ω Duodecuple coils or the V8 Baby Mesh Coils 0.15Ω. These coils are newly designed, the light coil will emit a light when you are vaping and does also come in green or orange (Sold Seperately), the mesh coil has larger heating area to speed heating process.